As a music director, you wear a lot of hats. You direct, you play, you email, you plan, you listen, you conduct, you coordinate, etc. Your time is valuable and you know that your rehearsal time is valuable. How can you make sure you're making the most of it? It always helps me to start by getting organized. There's something about crisp file folders, colored pens, pretty charts, and a few fun paper clips that makes me feel more confident, productive, and ready to get to work. It's hard enough keeping track of your own calendar, let alone those of your entire choir. Print and post a simple monthly calendar and ask everyone to sign out for days they won't be there. This gives you an idea how many you'll have on a given Sunday and what music might be best. Filing cabinets, filing boxes, or some combination of the two - whatever resources you have, straightening up and organizing your music library (choral anthems, ensemble music, musicals/cantata scores, piano/organ books, etc.) will save you lots of time and energy (and hassle!) later on. Sort by type, alphabetize, and go ahead and create a digital database while you're at it for easy planning later. This may be a no-brainer, but keeping organized records of financial expenditures throughout the year makes committee meetings and annual trustee reports so much easier. I like using a spreadsheet that does some of the math for me (like the free one in this post). 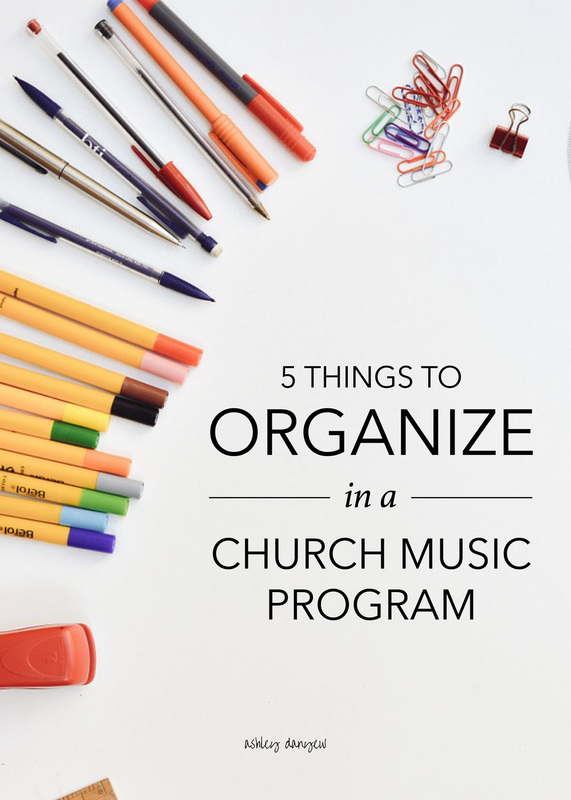 What are your favorite organization tips and tricks for church music programs?